Senator Joe McCarthy is infamous for having exploited the specter of Communist infiltration in the government for his own aggrandizement. The man claimed to possess a list of 57 State Department employees who were known Communist moles. But instead of turning it over to the FBI for investigation, McCarthy chose to hold Congressional hearings to investigate the claims personally. These show trials made himself and his assistant Roy Cohn household names, and were discontinued only after it became clear that the entire effort had been nothing more than an exercise in destructive folly. Eventually the Senator died in office of peripheral neuritis, which was caused by decades of hard drinking. Joe McCarthy is a bachelor of 43 years. [...] He seldom dates girls and if he does he laughingly describes it as window dressing. It is common talk among homosexuals in Milwaukee who rendezvous in the White Horse Inn that Senator Joe McCarthy has often engaged in homosexual activities. The Young Republicans held a state convention in Wausua, Wis., at which Sen. McCarthy was an honored guest. During the convention, McCarthy spent the night with William McMahon, formerly an official of the Milwaukee County Young Republicans, in a Eausua hotel room, at which time, McCarthy and McMahon engaged in illicit acts with each other. McCarthy briefly considered filing a suit but took no action, because it would have meant testifying about his sexual predilections. Instead, he married his research assistant Jeannie Kerr and they adopted a baby girl. The myth of "McCarthyism" is the greatest Orwellian fraud of our times. Liberals are fanatical liars, then as now. The portrayal of Sen. Joe McCarthy as a wild-eyed demagogue destroying innocent lives is sheer liberal hobgoblinism. Liberals weren't hiding under the bed during the McCarthy era. They were systematically undermining the nation's ability to defend itself, while waging a bellicose campaign of lies to blacken McCarthy's name. If any other religious cult knew so few basic facts about its own seminal beliefs as the liberal cult does about Joe McCarthy, Janet Reno would gas them. 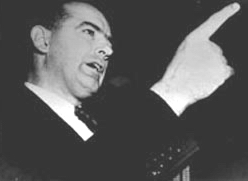 Despite the left's creation of a myth to defeat legitimate charges of treason, McCarthy had so badly stigmatized Communism, his victory survived him. In his brief fiery ride across the landscape, Joe McCarthy bought America another thirty years. For this, he sacrificed his life, his reputation, his name. The left cut down a brave man, but not before the American people heard the truth. Perhaps McCarthy was Coulter's muse when she was writing Treason. Jump back some 50 years to a February 1954 speech he gave in Charleston, West Virginia. That's when the Senator denounced the entire Democratic Party as a group of traitors: "The issue between the Republicans and Democrats is clearly drawn. It has been deliberately drawn by those who have been in charge of twenty years of treason. The hard fact is -- the hard fact is that those who wear the label, those who wear the label Democrat wear it with the stain of a historic betrayal." That sentiment sure sounds familiar.